On New Years Eve, seven friends/work colleagues head off to a remote lodge in the woods to see in the new year. Meanwhile a guy searching for his missing brother and fiance comes across the friends just as they are attacked by 3 masked crazies. You might think this was a random attack by the assailants but they have a reason for targeting these people and it isn't entirely random. Annoyingly cliche and predictable at times this does have quite a few good points to it. The casts boasts some familiar names, with William Baldwin and Richard Grieco playing the more major roles. Plus horror legend and all round genuinely awesome guy Bill Moseley unfortunately typecast as a wigged Otis character ( "Jesus loved you more than me") but as always he gives it his all. Protagonist John Hennigan (pro wrestler Johnny Impact) along with fellow wrestler Aaron Aguilera as a burlap masked antagonist have some pretty good fight sequences together. The dialogue is a bit sloppy but is bearable. The rest of the cast takes up the usual mantle of dumb blonde, drunk jock, token randy couple and cute unassuming final girl. The kills, special effects and stunts make this movie a good watch with some great ideas well executed. The soundtrack and compositions are effective as well. Christopher Ray is responsible for directing and producing some great movies (in my opinion), CIRCUS KANE being one of them. Not forgetting 3 Headed Shark Attack and the Mega Shark vs movies. 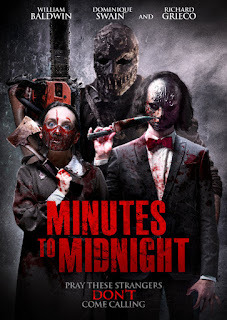 Minutes To Midnight is another good one from this director and for me is one of the better indie Slashers I've seen in recent times.